I aim to make my KS2 events entertaining and inspiring, filled with audience interaction, fascinating facts and plenty of jokes! 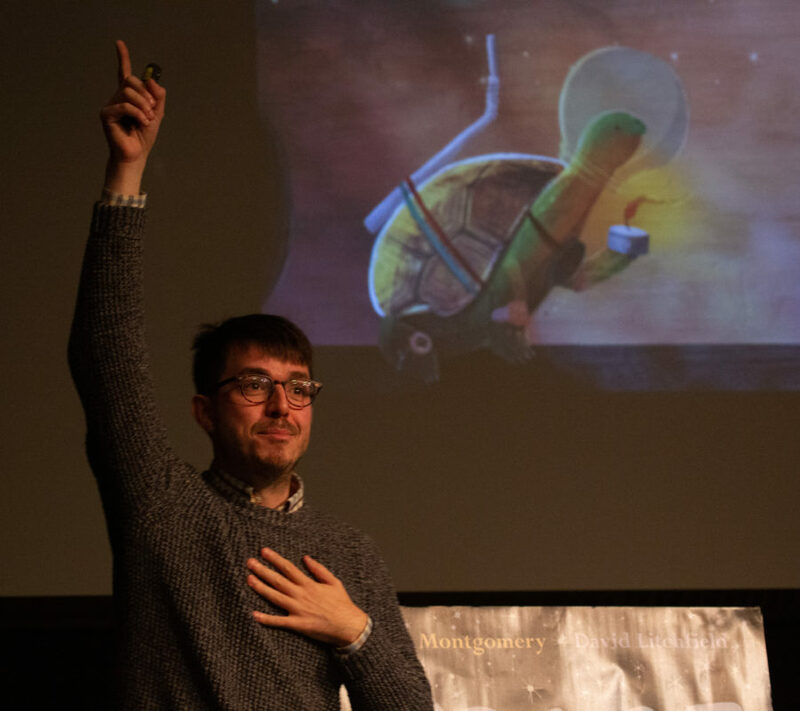 My talks focus on three key areas: teaching children to use their imagination, building on their language skills, and above all, revisiting and editing their work to improve it. After all, your first try is rarely your best! I also push children to think about the world around them in a different light: to see how unusual, exciting and strange life can be, and how it makes the best inspiration for stories. MINIATURE MARVELS WITH “MAX AND THE MILLIONS”! In MAX AND THE MILLIONS, a boy discovers a microscopic fantasy civilisation living on a bedroom floor. After discussing microscopic worlds – how there are millions of living creatures all around us, so small we can’t even see them – the children imagine what it would be like to be an ant-sized person. How would everyday objects and rooms look to you? This can lead to a writing workshop where the children write entries from the expedition diary of a pint-sized explorer, or a longer workshop where they design maps of new kingdoms in bathrooms, kitchens, gardens and more! Suitable as a talk or workshop for Years 3 to 6. In PERIJEE & ME, a girl discovers an incredible shape-shifting alien and secretly raises him as a little brother… that is, until he takes over the world! After discussing aliens and all the different examples we can think of in books and films, the children create their very own alien and describe every part of it, using vivid language, adjectives, similes and metaphors to create an amazing descriptive paragraph. SCARE YOURSELF SILLY WITH “CHRISTMAS DINNER OF SOULS”! In my collection of gruesome festive horror stories, CHRISTMAS DINNER OF SOULS, I aim to make the reader squirm with terror – but how can you do it? After discussing horror scenes and the techniques writers use to build up to a big scare, the children write a scene of their own, using vivid language, tension and pace to build to a terrifying climax! With the help of atmospheric music and dramatic readings, the children revisit their work several times, improving it each time and learning the value of editing. Suitable as a workshop for Years 4 to 6 – max 35 children per session. FACE YOUR FEARS WITH “THE TORNADO CHASERS”! In THE TORNADO CHASERS, a group of children decide to face their fears and do the most terrifying thing they can think of – race across bear-infested countryside and stand next to a raging tornado! In this talk, I talk about fear and what it means to be afraid – how our minds can trick us, how everyone is frightened of something, and how I use my own fears to inspire me as a writer. Is it wrong to be frightened – and can we ever overcome our worst fears? Suitable as a talk for Years 3 to 6. BREAK THE RULES WITH ROSS MONTGOMERY! Rules are important – but not when it comes to writing stories! My books are filled with characters who do things they shouldn’t do, and that helps make them funny and exciting. In this talk, I help the children plot a story about a character who breaks a rule, complete with a crisis, climax and resolution. Will their character be punished? Will they get away with it? Or will they get sucked into a black hole in the sky and transported to a planet on the edge of the solar system populated entirely by geese? Suitable as a talk or workshop for Years 3 to 5. SET THE SCENE WITH “THE BUILDING BOY”! In my picture book THE BUILDING BOY, a young boy creates a giant version of his architect grandmother out of bricks, glass and girders… which comes to life and takes him on a magical adventure across moonlit fields, great wide oceans, and cities filled with a forest of streetlamps! Inspired by the story, we think about other places which Grandmother and the Boy could have visited. Then we think of how we can set the scene by engaging all our senses and describing what they could see, hear, and feel. An opportunity to begin work which could lead to a vivid display, stretching their imaginations and vocabulary!